Between 1993 and 2013, violent crime declined at an extraordinary pace. 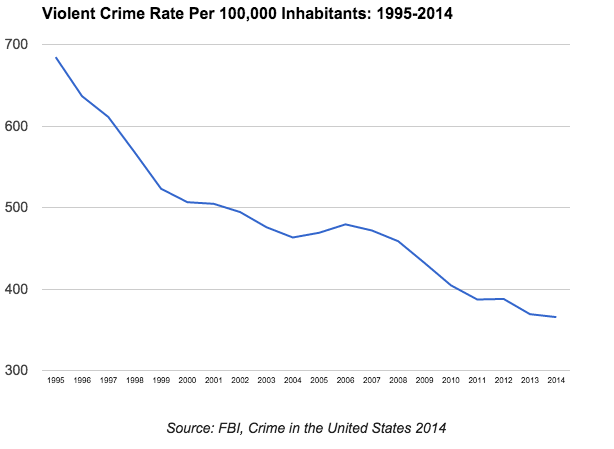 FBI data show the violent crime rate falling to 367.9 violent crimes per 100,000 inhabitants in 2013, from 713.6 in 1994. Similarly, the murder rate declined to 4.5 per 100,000 inhabitants in 2013 from 9.0 in 1994. The 2014 data made available on Monday should lead one to believe the downward trend remains. The overall violent crime rate declined to 365.5 per 100,000 inhabitants in 2014. The murder rate remained at 4.5 per 100,000 inhabitants, though there was a 2 percent decrease in murders overall from the previous year. Commenting on the report, FBI Director James Comey said, "We hope this information will become part of a balanced dialogue in communities and in the media—a dialogue that will help to dispel misperceptions, foster accountability, and promote transparency in how law enforcement personnel relate to the communities they serve." Indeed, the media need to pay attention to the report. Even in the midst of a decline in violent crime, the perception is that it is on the rise. In October 2014, for example, Gallup reported that 63 percent of Americans believe there is more crime in the United States than the year before. Recently, there have been some reports covering the spikes in homicides in some U.S. cities. It is far too early to draw any conclusions based on various media reports. While some hard data may be provided on a city-by-city basis, any increase in homicides may be statistically insignificant from a pure data standpoint, and certainly not reflective of a trend. There were, for example, increases in homicides in 2005 and 2006, but these years proved to be outliers. By 2007, the national murder rate began to decline once again, and it has generally stayed on that course. What we know is that national decline in violent crime continued in 2014, which is, indeed, good news, and we know it is part of a downward trend spanning more than 20 years. We should be talking about are policies that can continue to improve and enhance the safety of our communities. 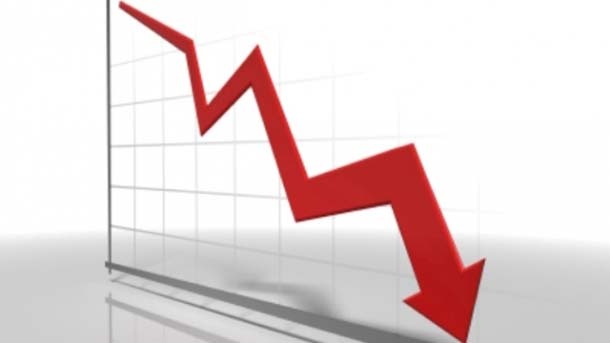 The Brennan Center for Justice has noted that this decline had very little to do with the reliance on incarceration, rather, it was socio-economic factors that played major roles. State efforts that place emphasis on diversion and drug treatment programs and rehabilitation in the form of education and work training programs for those who do enter the prison system have reduced recidivism, helped lower crime rates, and saved taxpayers money. If the decline in violent crime is to continue, the conversation has to be about whether those who have served time are rehabilitated and can re-enter our communities as productive members of society. Engineers at Apple are drawing a line in the sand. According to The Hill, multiple employees of the company have stated that they will outright refuse to comply with orders from the FBI to weaken iPhone security, should the agency prevail in an ongoing court battle. For some, this would mean resigning from the company, for others, simply declining to write specific code, whatever the cost may be to their professional futures. During a Senate Judiciary Committee hearing on Wednesday, FBI Director James Comey signaled support for Sentencing Reform and Corrections Act, calling the bill "reasonable." The legislation, which would expand the existing federal "safety valve" exception to mandatory minimum sentences, was approved by the committee in October and is awaiting action before the full Senate, which could happen in early 2016. In early November, FreedomWorks released a letter of support for the bill. Is Violent Crime Really on the Rise? Media reports are stoking fears of a sharp rise in homicides in some cities in the United States. This has been used by some to advance the notion that crime is rising across the country. In fact, violent crime rates are at historic lows, according to the most recently available data, and there is no indication that there is a concerning national trend developing.